Miss Gabrielle Ray was born in Stockport on 28th April 1883 and made her stage debut in the musical "Miami" at the Princes's Theatre in Oct 1893. The show only ran for 11 performances and was not a success. From 1899 until 1902 she toured the English provinces until spotted by George Edwardes who engaged her to understudy Gertie Millar in the Toreador at the old Gaiety. That was the start of a long association with him and he next moved her to the Apollo where she succeeded Letty Lind in "The Girl From Kays". The next show she was in made her a star. The old Gaiety had closed and the new Gaiety opened to the musical, "The Orchid" in Oct 1903. His Majesty King Edward VI and Queen Alexandra were both there for the opening night, Gertie Millar starred and Gabs had the not inconsiderable part of Thisbe. Her acting was not strong and her singing was weak but when she danced it was with an unbelievable lightness and when she high kicked her leg flew over her golden curls effortlessly. "The Orchid" was a huge success running for 559 performances (5 more than Gilbert and Sulivans "The Gondoliers"). Gabrielle's next three shows were all at The Prince of Wales. In 1905 she was in "Lady Madcap"; 1906 "The Litle Cherub" and later that year she was in "See See" her first encounter with Lily Elsie. Later that same year she was in yet another show "Les Merveilleuses" at Daly's. All of these were George Edwardes productions. This show flopped in spite of a name change to "The Lady Dandies" and its failure forced Edwardes into putting on what he was sure was a stop gap. "The Merry Widow" was too continental for his liking so he had it virtually re-written with a younger widow and a lot of comedy to anglicise it. He had no intention of spending good money on this show so the costumes were almost second hand. It opened in June 1907, Lily Elsie had the title role and Gaby was Frou Frou. It ran for 778 performances becoming Edwardes biggest hit and knocking "H.M.S. Pinafore" at 700 shows into a cocked hat. Gabrielle remained at Daly's for "The Dollar Princess", Sept 1909, again with Lily Elsie in the lead. 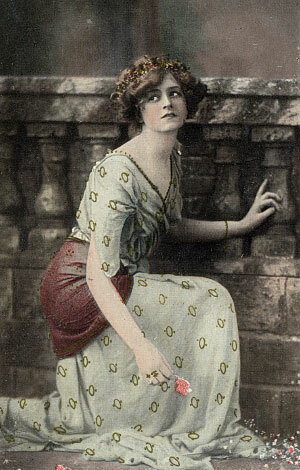 At the Gaiety in 1911 she was in "Peggy" after which she had a four year break. She returned to the stage in 1915 in the musical "Betty" at Daly's and in 1916 she was at the London Hippodrome in "Flying Colours". Following this she again virtually retired appearing in the occassional provincial pantomime. One of the most unusual gifts she ever recieved was a huge basket with a grape vine growing over the hoped handle. It had taken 8 years to grow, took 4 men to carry it and on it were twenty bunches of grapes. Incidentally Gaby was no financial slouch either. When she was in "The Merry Widow" not only was she earning more than Lily Elsie she also managed to sell Lily her old clothes!